Wrap potatoes in foil and bake at 400° for one hour or until soft. (Do not microwave potatoes to bake). When potatoes cooked, remove foil and cut in half placing them on a large foil covered baking sheet. Scoop out potato centers. Add a touch of butter to each center. Crumble bacon and sprinkle in each scooped potato half. Sprinkle mozzarella cheese over each potato. 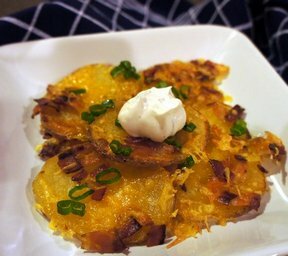 Sprinkle cheddar cheese over each potato. 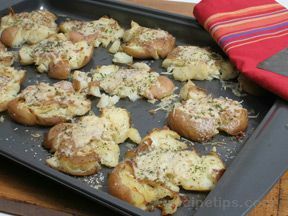 Place baking sheet in the oven and remove when cheese is melted and tops are slightly browned. 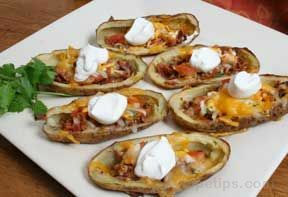 For extra special potato skins, after cheese melts, remove potatoes and sprinkle another 8 oz of mozzarella and another 8 oz of cheddar cheese over potatoes. Place in oven until second layer of cheese melted and slightly browned.